February 1st, 2016. Bandai's online virtual pet, hosted on the official Digimon World -next 0rder- title site, evolved to Perfect-level today. 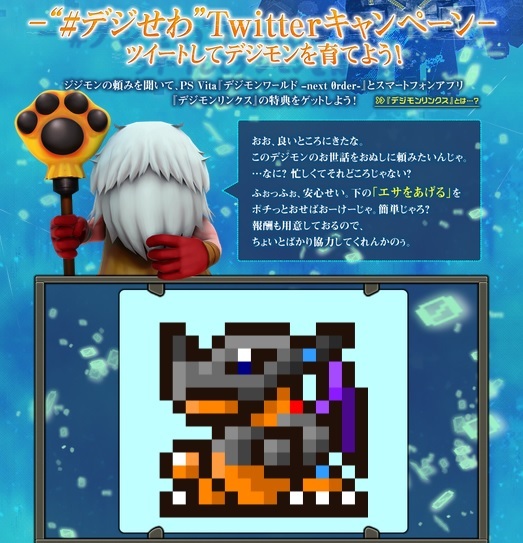 The Greymon that fans had raised over Twitter became Metal Greymon once it passed the 15,000 care mark, unlocking an additional Chain Melon and ten Digistones as in-game rewards for fans in -next 0rder- and Linkz. In order to reach Ultimate, Metal Greymon requires 25,000 cumulative care actions; at that point fans will unlock one more Chain Melon, 15 Digistones, and a Digimon World -next 0rder- smartphone wallpaper. The Melons extend a Digimon's lifespan, while Digistones restore stamina. Previously, the online Digimon had evolved to Agumon on the 26th, and Koromon on the 25th. Fans can participate in the campaign by going to the page and clicking on エサをあげる ("Give food") which will create a premade tweet for them to share. ehh where's smartphone wallpaper?? i need it for my phone~~!! It's not available yet, the tweet campaign has to cross the next threshold before we can download it. This makes them awesome at being set up to track the portable's utilization in entire stealth.